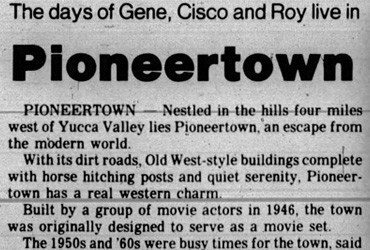 Harvey in Hollywood | Feb. 17 1950 | Historic Pioneertown Calif.
Hi Neighbors: If this column suddenly zooms out into space, blame it onto the picture I am currently making for Columbia. It’s called “Atom Man vs Superman” and it’s a serial in 15 chapters. If you think it isn’t the trick of the year to translate the action of Superman from the funny papers to film, just try it one rainy afternoon. LYLE TALBOT.. (an Omaha Nebraska boy who made it good in Hollywood)… is ATOM MAN, and yours truly plays ‘Alber” the mad scientist (J.G.). The ray guns, gizmos and gimtracks we use to try and defeat Superman are a sight to behold. But don’t sell serials short. This one will cost about 250 thousand bucks to make and will gross about 3 million at the boxoffice. Supermoney from Superman! Personal Publicity Dept: We have our picture in the current issue of Saturday Evening Post (issue of Jan. 28).. in color too! 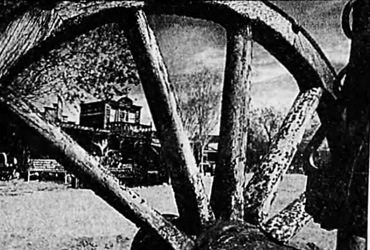 In the layout for pictures for H. Allen Smith’s article on Pioneertown, “Just Like The Movies” the cowboy leaning on the hitching rail in front of the newspaper office is Harvey. 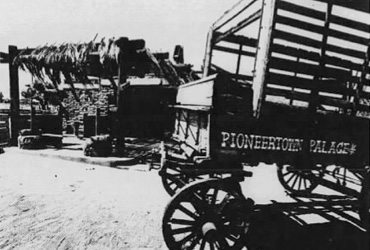 The pictures were made while we were up in the desert making “Girl From San Lorenzo,” a Cisco Kid western. MABEL STARK, famous woman animal trainer, is a living example of the old “show must go on” school of entertainers. Just about a week ago MABEL was seriously mauled and chewed by a tiger called Pasha. For awhile the medics thought they would have to take off her right arm, but finally managed to save it. Now Miss Stark sits up in bed and tells us that she will be back in the arena with her cats by February 15th. We worked with Pasha in our picture “Forbidden Jungle” and she’s a lot of cat. Good luck, Mabel, we admire your courage, but don’t envy your job. The papers are full of the actions of INGRILD BERGMAN, and we won’t attempt to tell you what you have already read. But you might be interested in how Hollywood feels about her. Everyone believes she is a very foolish girl and one who, in the company of RITA HAYWORTH, had done much to hurt Hollywood in the eyes of the world. These stars surely have a right to a personal life, but when their personal lives become mud-splattered public property it reflects on Hollywood, who has enough trouble anyway. The film industry gave both of these girls a great amount of fame and fortune and, in our minds, they have used it badly. INGRID has announced that she is retiring from the screen, but someway we doubt that too. We of Hollywood only hope, and we repeat ourselves, that you, the public, will not judge the entire industry by the acts of a couple of our elderly juvenile delinquents. JACK BUETEL is a perfect example of Hollywood’s file and forget system of contracts. Seven years ago he was signed by HOWARD HUGHES to star with JANE RUSSELL, then unknown, in “The Outlaw.” Jack got lost in the buxom shadow of Jane and has never made another picture. He’s drawn salary all these years, but has done nothing. Now he’s supposed to make another pic . . “King Football,” but Jack tells us that he has signed no papers for the job. Jack is now 32 years old and forty pounds heavier than when he made love to Jane, so he should be one of those “new faces” Hollywood keeps looking for. JANE RUSSELL, just to keep you informed, had her chest X-rayed as a publicity move for “Chest X-Ray Week.” The report was, and we quote: “Nothing wrong with Miss Russell’s chest!” They wasted an X-ray plate, anyone could issue that statement after seeing Jane… IN THE MOVIES!